A podcast series from the Center for Documentary Studies at Duke University explores what it means to be White. Events of the past few years have turned a challenging spotlight on White people, and Whiteness, in the United States. An introduction to our series exploring what it means to be White. By John Biewen, with special guest Chenjerai Kumanyika. For much of human history, people viewed themselves as members of tribes or nations but had no notion of “race.” Today, science deems race biologically meaningless. Who invented race as we know it, and why? By John Biewen, with guest Chenjerai Kumanyika. Chattel slavery in the United States, with its distinctive – and strikingly cruel – laws and structures, took shape over many decades in colonial America. The innovations that built American slavery are inseparable from the construction of Whiteness as we know it today. By John Biewen, with guest Chenjerai Kumanyika. “All men are created equal.” Those words, from the Declaration of Independence, are central to the story that Americans tell about ourselves and our history. But what did those words mean to the man who actually wrote them? By John Biewen, with guest Chenjerai Kumanyika. 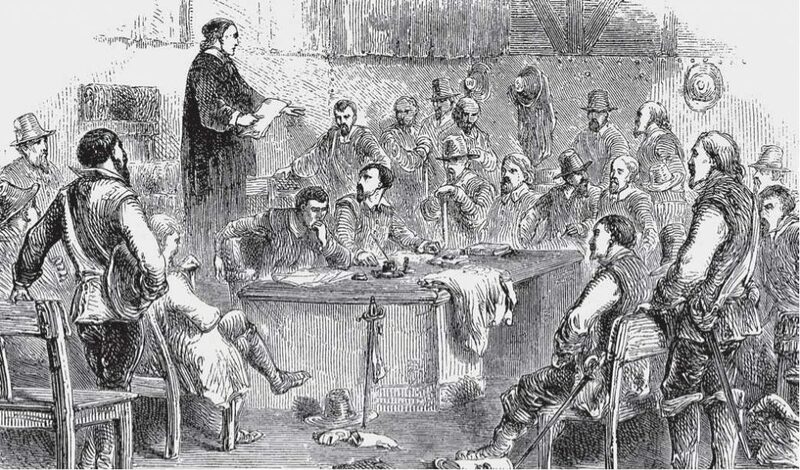 Photo: Meeting of the Virginia House of Burgesses, 1619. Library of Congress. Seemingly almost too short, but lays some good groundwork (in retrospect) for what is to come. Here’s where the story begins to heat up and lay some groundwork. I’d never thought about the subtle changes in early American law that institutionalized the idea of slavery, race, and racism, which is very well laid out in the third installment, though I suspect is just a short sketch of a more horrifying past. In particular: laws that indicated that slaves who became Christian didn’t need to be freed, laws which indicated that the slave status of children was derived from the mother (and not the father), and laws which prevented white women from marrying African Americans. I’d sadly never heard the history of the case of John Punch or any of the other examples in episode 3. Having been born in South Carolina and then living in Georgia on a mountain at which John C. Calhoun apparently pointed at and uttered the phrase, “Thar’s gold in them thar’ hills.” I’m all too entrenched in his version of history. I’m also viewing this from a larger big history perspective and see a few other things going on as well, but sadly I’m woefully undereducated in these areas. I’m going to have to get some new reading materials. There’s a lot of history concerning Thomas Jefferson and even Ralph Waldo Emerson which I’m going to have to go back and brush up on as there are large pieces missing from my general education. The discussion certainly reframes the way one could see America and it’s history from a vastly different perspective that just isn’t discussed enough. I’ll have to go back and relisten to this for some great quotes as well as one from T. Veblen. There are at least two more episodes in the series that I can’t wait to listen to before I surely circle back around and listen to them all a second time. This series is truly great. I’m subscribing to their prior episodes and can’t wait to see what they come up with in the future. I highly recommend it. Thanks to Jeremy Cherfas who suggested it to me indirectly via his feed.